It’s about time to start preparing for this years tailgating season. Preseason games have already begun and before you know it football season will be here. Showing up to a stadium parking lot hours ahead of game time to fire up the barbecue and play a game of corn hole is annual for most fans! With that being said, it’s important to be prepared for the first tailgate of the year. With that in mind here are some essentials for being the tailgate master for this years football season! These are just a few of the essential items needed for a tailgate. Of course some tailgaters have their own pre-game rituals. 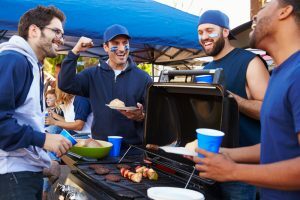 Let us know in the comments below what your pregame tailgate consist of! Let’s kick off the 2018 football season right!